Club Penguin Cheats by Mimo777 Club Penguin Cheats by Mimo777: Penguin of the Day: Cloi 1! Penguin of the Day: Cloi 1! 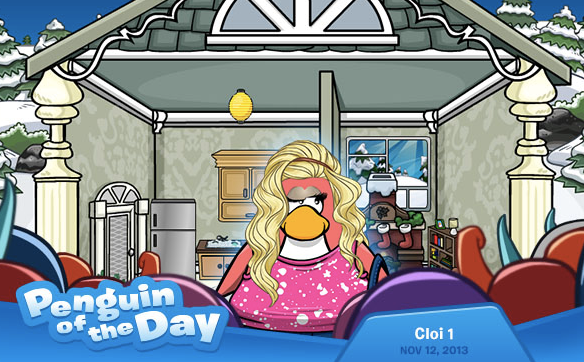 Check out Cloi 1’s igloo, it’s so homely and cosy! its making me excited for the festive season (too soon?)! She’s a real fashionista too; I just love the eye make up! All winners get 5,000 coins so nominate penguins! NEW! Penguin of the Week: Sir Sillines! Throwback Thursday: Puffle Party 2009! Club Penguin Pin Cheat - PUFFLE MEDIC PIN! Month in Review: November 2013! #WaddleOn: Operation Puffle Part 3! Help Chattabox Stage a Play! The NEXT Big Update: Club Penguin on iPad! Gold Puffle Behind The Scenes Video Coming Soon! Operation Puffle: Herbert Meetup Times! Penguin of the Day: Rlact! Club Penguin #WaddleOn: Operation Puffle Part 2! Club Penguin's Got Talent: With Chattabox! UK BAFTA Kids' Vote 2013! Exciting News About Penguin of the Day! New Trophies in the UK Club Penguin Magazine! Penguin of the Day: Awsomebacon2! Gold Puffle: PH Meetup Times! Get your Gold Puffle TODAY! Puffles Missing Around the Island! Furniture Catalog Cheats: November 2013! 2013 Stage: Quest for the Golden Puffle! Club Penguin Pin Cheat - HERBERTECH PIN! #WaddleOn: Operation Puffle Part 1! My Day in Club Penguin: PufflePosh! Penguin of the Day: Artemis4567! Join Chattabox for a Game of Musical Chairs! Penguin of the Day: Muddypaws12! Disney Channel Game On: Gold Puffle! Club Penguin #WaddleOn: With Gary! Penguin of the Day: Eclaireyum1! Ask a Club Penguin Intern! Penguin of the Day: Bacon935! Club Penguin Pin Cheat - SCISSORS PIN!